Timothy Richard "Tim" Tebow (born August 14, 1987 in Manila , Philippines ) is a Heisman Trophy-winning American football quarterback for the Florida Gators. He was the first college football player to both rush and pass for 20 touchdowns in a season and was the first sophomore to win the Heisman. Tebow played quarterback for Nease High School in Ponte Vedra Beach, Florida , where he became a Division I-A recruit and ranked among the top quarterback prospects in the nation as a senior. After a tight recruiting battle, he chose to attend the University of Florida over the University of Alabama . Tebow, being a dual threat quarterback adept at rushing and passing the football, was used in his freshman season largely as a change of pace to the Gators' more traditional quarterback, Chris Leak. His contribution in the 2006 college football season was as a key reserve who helped the Gators win college football's national championship game for the first time since 1996. Tebow was born on August 14, 1987 in the Philippines to Bob and Pam Tebow, who were serving as Christian missionaries at the time. While pregnant Pam suffered a life-threatening infection with a pathogenic amoeba. Because of the drugs used to rouse her from a coma and to treat her dysentery, the fetus experienced a severe placental abruption. Doctors expected a stillbirth and recommended an abortion to protect her life. She carried Timothy to term, and both survived. All of the Tebow children were homeschooled by their mother, who worked to instill the family’s Christian beliefs along the way. In 1996, legislation was passed in Florida allowing homeschooled students to compete in local high school sporting events. The law specifies that homeschooled students may participate on the team of the local school in the school district in which they live. The Tebows lived in Jacksonville, Florida , and Tim played linebacker and tight end at the local Trinity Christian Academy for one season. Tebow's preferred position was quarterback, but Trinity football team's offense did not rely on passing the football, so he began to explore his options to play for a new high school. He decided to attend Nease High School, which under head coach Craig Howard was known for having a passing offense. With the rest of his family living on a farm in Duval County , Tim and his mother moved into an apartment in nearby St. Johns County , making him eligible to play for the football team at Nease. His performance soon turned heads and led to a minor controversy of him being a home-schooled student having his choice of school to play for. As a junior at Nease, Tebow’s stock rose as he became a major college football quarterback prospect and was named the state of Florida's Player of the Year. He would repeat as Player of the Year in his senior season. One of his highlights as a high school athlete was finishing a game on a broken leg. During his senior season he led the Nease Panthers to a state title, earned All-State honors, was named Florida's Mr. Football and a Parade All-American. Tebow finished his high school career with 9,810 passing yards, 3,186 rushing yards, 95 passing touchdowns and 62 rushing touchdowns. He played in the U.S. Army All-American Bowl Game in San Antonio, Texas which features the top 78 senior high school football players in the nation and is shown nationally on NBC television. Tebow was considered one of the nation’s top recruits and was the subject of an ESPN “Faces in Sports” documentary. The segment was titled "Tim Tebow: The Chosen One", and focused on Tim’s homeschool controversy and missionary work in the Philippines, as well as his exploits on the field of play and the college recruiting process. Tim Tebow was also featured in Sports Illustrated on the “Faces in the Crowd” page. In 2007 he was named to FHSAA's All-Century Team that listed the Top 33 football players in the state of Florida's 100 year history of high school football. Despite having family ties to the University of Florida, where his parents first met as students, he remained open-minded during the recruiting process and became very close to Alabama coach Mike Shula. After careful consideration he decided to play for Urban Meyer's Florida Gators. One of the reasons he chose Florida was because of Meyer's spread option offense, an offense for which Tebow was deemed an archetypal quarterback. Tebow spent the last three summers before enrolling at the University of Florida in the Philippines, assisting with his father's orphanage and missionary work. He is also a self-proclaimed virgin and is "saving himself" for marriage. Tebow appeared late Saturday night, July 25, 2009 at a Rascal Flatts concert and sang a few lines along with the group and Darius Rucker, as well as signed and tossed a football out into the crowd. Tebow started his career at Florida in the 2006 "Orange and Blue" Spring scrimmage, where he completed 15 of 21 pass attempts for 197 yards and one touchdown. Coach Urban Meyer declared that Leak would remain the starting quarterback despite the expectations and performance of Tebow in the game.Prior to the 2006 season, Tebow was listed by Sports Illustrated as college football's future top mobile quarterback. Tebow made his college debut coming off the bench behind Chris Leak in a goal line situation against Southern Miss. He rushed for a touchdown on a designed quarterback scramble on his first play. In his next game, he led the team in rushing yards against UCF. He made his SEC debut against the Tennessee Volunteers on September 16. His performance included a ten-yard run on his first carry and converting a critical fourth down near the end of the game, which led to the Gators' go-ahead touchdown. Tebow's biggest game in the season came against the LSU Tigers on October 7, where he accounted for all three of the Gators' touchdowns, passing for two and rushing for another. Tebow had a one-yard run on the goal line for his first score, a one-yard "jump pass" to tight end Tate Casey, in which he jumped in the air and double-pumped his arm before releasing the ball, and a 35-yard play-action pass to wide receiver Louis Murphy. Tebow played a role in the Gators' victory in the 2007 BCS National Championship Game against Ohio State. He threw for one touchdown and rushed for another, finishing with 39 rushing yards. He finished 2006 with the second-most rushing yards on the Gator team. Tebow was named as one of the "Breakout Players of 2007" for college football by Sporting News, and was named the starter at quarterback for the Florida Gators before the 2007 season. 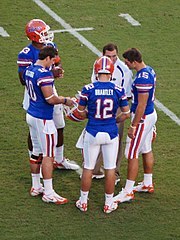 The Gators' offense in 2007 was expected to be similar to what Urban Meyer used at Utah, since Meyer views Tebow as “very similar to Alex Smith.” Smith was quarterback for Meyer's last team at Utah in 2004, which became the first team from outside the BCS conferences to play in and win a BCS bowl game, and went on to be the top overall pick in the 2005 NFL Draft. There were some questions about how he would perform as a full time passer, but he opened the year 13-of-17 for 300 yards and 3 touchdowns in his starting debut against Western Kentucky University . Tebow finished the regular season with 217 completed passes in 317 attempts for 3132 yards gained and 29 touchdowns with six interceptions—giving him the second highest passing efficiency in the nation with 177.8. Additionally, he rushed 194 times for 838 yards and 22 touchdowns on the ground through 11 games. Tebow's 51 touchdowns were more than 87 Division 1-A Teams scored. In week 4 of the season, when the Gators faced Ole Miss in an SEC match-up, Tebow broke the school record for rushing yards by a quarterback in one game, with 166 yards. On November 3, against Vanderbilt, Tebow rushed for two touchdowns to break the all-time SEC quarterback TD record in a single season. Against LSU, leading by 10 in the 4th quarter, Tebow was largely ineffective and had a turnover as he was unable to lead his team to any score, and LSU came back to win the game. LSU went on to win the 2007 National Championship. In a game versus the South Carolina Gamecocks on November 10, Tebow broke the school record for rushing touchdowns in a season and set a career high with 5 rushing touchdowns. This brought his season total to 19 rushing touchdowns, which tied him for the SEC record for any player in a season (shared with Shaun Alexander, Garrison Hearst, and LaBrandon Toefield). He also broke Danny Wuerffel's conference record for touchdowns accounted for in a single season with 42. On November 17, Tebow had a record day against Florida Atlantic , he scored his 20th rushing touchdown to set a new conference record for most rushing touchdowns in a season. He also became the only person ever in NCAA History to score 20 touchdowns rushing and 20 touchdowns passing in the same season. After the season was over, Tebow became a favorite for the Heisman Trophy, given to the most outstanding college football player of the year, which he won on December 8 in New York City. He also received the Davey O'Brien Award, annually given to the best quarterback in the nation, on February 18 in Fort Worth, TX. While the Gators finished the season in Orlando, Florida with a 41–35 loss to Michigan in the 2008 Capital One Bowl, Tebow maintained his record for both rushing and passing for at least one touchdown in every game played, and he raised the record for total touchdowns accounted for in a single season to 55. He played with a soft cast on the hand he broke in his previous game. On December 8, 2007, Tim Tebow was awarded the Heisman Trophy, finishing ahead of Arkansas's Darren McFadden, Hawaii's Colt Brennan, and Missouri's Chase Daniel. He was the first underclassman to have ever won the Heisman Trophy. He garnered 462 first place votes and 1957 points, 254 points ahead of runner-up Arkansas running back Darren McFadden. He finished the regular season as the only player in FBS history to rush and pass for at least 20 touchdowns in both categories in the same season. He had 32 passing touchdowns, and 23 rushing touchdowns. Tebow's rushing TD total in the 2007 season is the most recorded for any position in SEC history. The total also set the record for most rushing touchdowns by a quarterback in FBS history. Tebow became the third UF player to win the Heisman Trophy, joining Steve Spurrier and Danny Wuerffel. Coincidentally, all three of Florida's Heisman-winning quarterbacks were sons of ministers. Before the 2007 season had even come to a close, Florida coach Urban Meyer stated that he would likely use 2 quarterbacks during the 2008 season to take some of the workload off of Tebow's shoulders. Tebow led the Gators in rushing in 2007 but also had to play through a bruised shoulder and broken non-throwing hand. On November 1, 2008 playing against the Georgia Bulldogs, Tim Tebow ran for his 37th rushing touchdown, breaking the school record previously held by former Florida running back Emmitt Smith. Tebow led the Gators to a 12–1 record in 2008. After clinching the Southeastern Conference Eastern Division title, the team played for and won the SEC title in the 2008 SEC Championship Game against the Alabama Crimson Tide. The win secured the #2 ranking in the final BCS standings, which earned the Gators the chance to play the #1 ranked Oklahoma Sooners in the 2009 BCS National Championship Game, which they won 24–14. Tebow appeared on the September 2008 cover of Men's Fitness magazine. On December 13, 2008, Tebow finished third in the 2008 Heisman Trophy voting with Oklahoma's Sam Bradford taking the top spot followed by Texas' Colt McCoy, despite Tebow receiving the most first-place votes. Tebow also won the Maxwell Award in 2008, becoming only the second player to win the award twice. On January 11, 2009, at a national championship celebration held at Florida Field , Tebow announced that he would not make himself eligible for the NFL draft but would instead return for his senior season at Florida. One day later, Tebow had surgery on his right shoulder to remove a bone spur in an effort to reduce chronic inflammation. Tebow opened the 2009 season continuing a streak of throwing and running for a touchdown in blowout wins over Charleston Southern and Troy . He ran for a touchdown in the third game, a win against Tennessee, but failed to throw for a touchdown for the first time since his freshman season. Tebow started against Kentucky despite suffering from a respiratory illness and taking two bags of intravenous fluids before the game. He ran for two touchdowns to put him in 2nd place on the all-time SEC touchdown list and he also threw for a touchdown. Late in the third quarter he was hit in the chest by Kentucky defensive end Taylor Wyndham and then in the back of the head while falling by knee of Florida tackle Marcus Gilbert. Upon impact, he briefly displayed a prominent Fencing Response with his left arm, indicating that a concussion had taken place. He lay motionless for several minutes before being helped to the sidelines. Once there, he vomited. He was taken by ambulance to the University of Kentucky Chandler Medical Center. A CT scan showed no bleeding in the brain, with the injury described as a mild concussion. Coach Urban Meyer stayed the night in the hospital with Tebow, who was discharged in the morning. On October 31, 2009 playing against the Georgia Bulldogs, Tim Tebow ran for his 50th and 51st rushing touchdowns, breaking the SEC career record previously held by former Georgia running back Herschel Walker. All-America selection by College Football News. On January 7, 2007, Tebow was featured prominently in an ESPN “Outside The Lines” feature on homeschooled athletes seeking equal access to high school athletics in other states. Because a homeschooler's access to public and private school athletic functions vary by state, Tebow and Miami Dolphins defensive end Jason Taylor (who was allowed to play at his local high school in Pennsylvania ) argue in favor of extending the right to play for local teams to more states. Upon becoming the first home-schooled athlete to be nominated for the Heisman Trophy, Tebow remarked, "That’s really cool. A lot of times people have this stereotype of homeschoolers as not very athletic – it's like, go win a spelling bee or something like that – it’s an honor for me to be the first one to do that." Tebow's example inspired equal access supporters in Alabama to name their bill in the Alabama Legislature "The Tim Tebow Bill". The bill, which is pending in the Alabama Legislature, will allow Alabama homeschool athletes to play for their local high school teams just as Tebow did in Florida. In January 2009, the "Tebow bill" was introduced in the Kentucky General Assembly. This bill, which is still pending, is also modeled after Florida state law, allowing homeschool athletes to play for their local sports teams. Tim Tebow received the 2008 Quaqua Protégé Award as an outstanding home-education graduate. Tebow returning for senior season. Retrieved on 2009-01-11. Tebow has surgery on non-throwing shoulder. Retrieved on 2009-01-12. Eichelberger, Curtis:  Bloomberg News, October 31, 2009, "Florida’s Tebow Breaks Walker’s SEC Touchdown Record"